Hopin is by far the most common oca variety in the USA. For many years, when suppliers offered a single variety, you could be pretty sure that it was Hopin, but that is slowly starting to change. 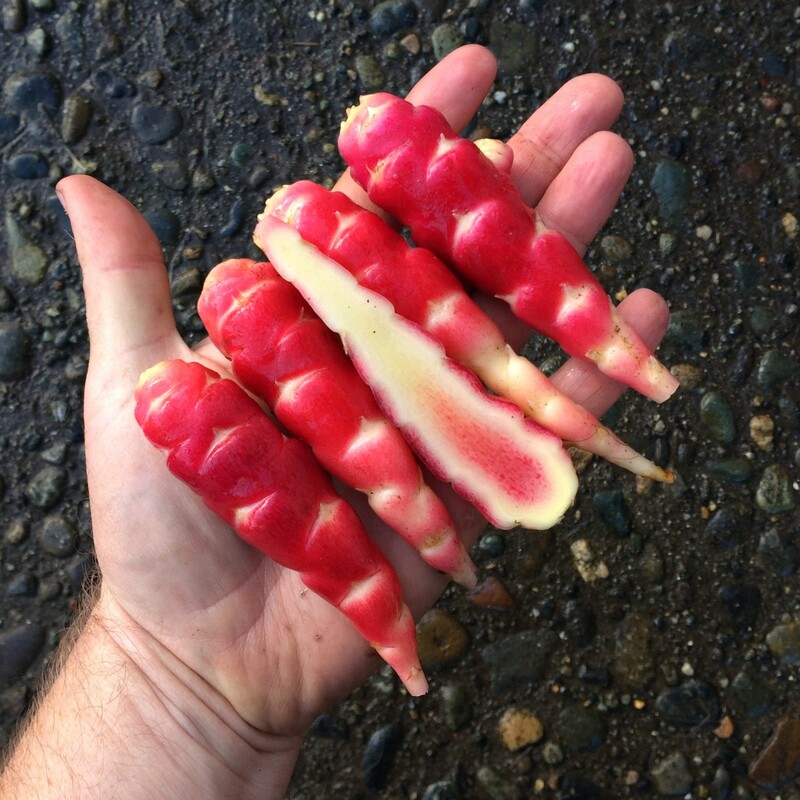 Hopin is notable for having reasonably good tolerance to warm weather and classic oca flavor. Hopin is moderately tart but not sweet, which fits the classic description of oca flavor: like a potato with sour cream or lemon. The cooked texture is soft. 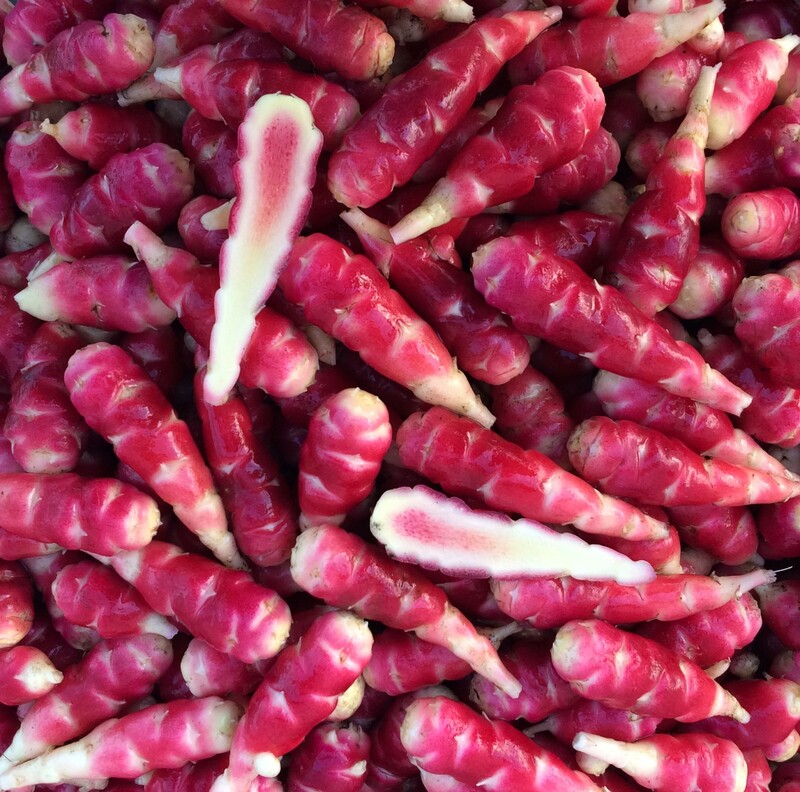 This variety loses most of its color with cooking, becoming light pink. Hopin plants are large and sprawl at maturity. Tubers are produced on relatively short stolons and sometimes crowd, producing irregular shapes. Tuberization photoperiod is about 12 hours, the same as most heirloom varieties. Average yield is 1.6 pounds. Maximum tuber length is 5.2 inches and average tuber length is 1.6 inches. There are about twice as many small tubers as large tubers with this variety. This variety occasionally produces white mutants which can be propagated by replanting the tubers. Hopin is an abundant flowerer with a mid-styled flower, flowering here from late June through August. You will receive the stated number of tubers, packaged in a wax envelope. We grade tubers by passing them through a grate. Small tubers are those that won’t fall through a 1/3″ grate, but that will fall through a 1 inch grate. Medium/large tubers are those that will not fall through a 1 inch grate. Seeds are open pollinated. Because oca is a polyploid hybrid, the seeds will not grow true to type. They are suitable for use in breeding or conservation efforts and could be used to select varieties similar to the parent type.